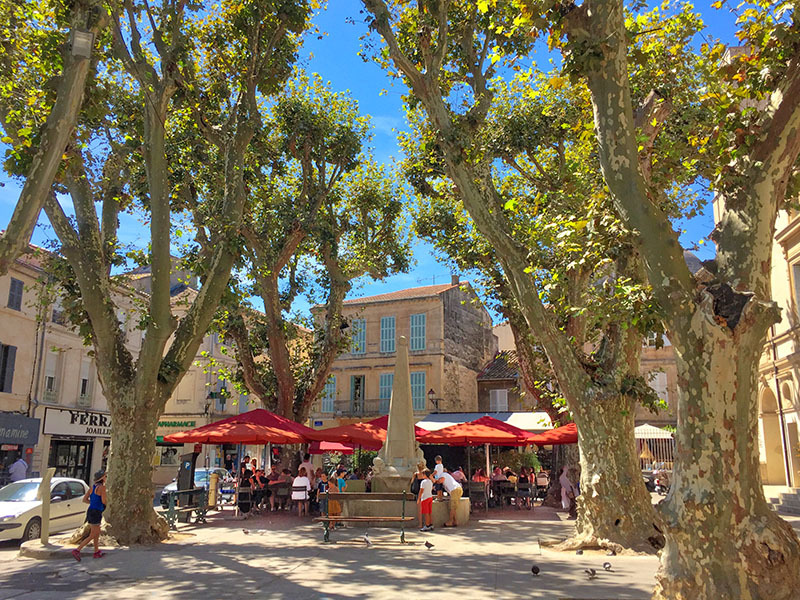 A close and trusted friend of impeccable taste has been holidaying with her husband and teen kids somewhere in the south of France for years now, and they always stay in the same little town – Saint-Rémy-de-Provence (St Rémy). That was endorsement enough for me to make St Rémy the base for our 7 day exploration of Provence. 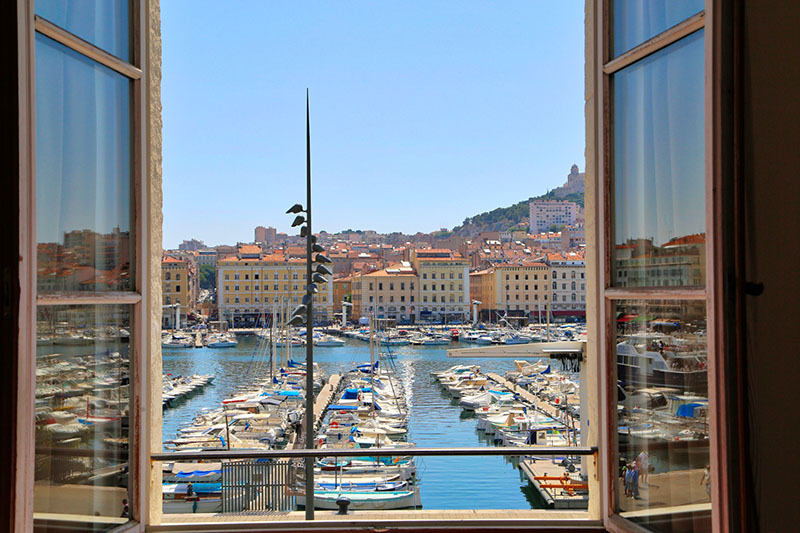 We were arriving from Paris , and discovered the cheapest flight that suited our timing flew Paris to Marseille. We love taking trains in Europe, but quickly discovered that driving was going to give us much more flexibility, as most of the townships in Provence do not have trains running to them. So we took the plunge and decided we should drive ourselves. We rented a car at Marseille airport, choosing to pay almost double to drive an automatic car (we thought we already had enough on our plates with driving on the ‘other’ side of the road on unfamiliar roads with signage in another language), and we drove 1 hour to St Rémy. As we approached, via little townships and impossibly narrow roads, the first thing that struck us was the avenue of magnificent Plane trees that lined the road leading to St Rémy. A little further along we were climbing a spectacular mountain, winding slowly up and over. Read more about the roads and driving in Provence HERE. It was sometimes a rather hairy experience. 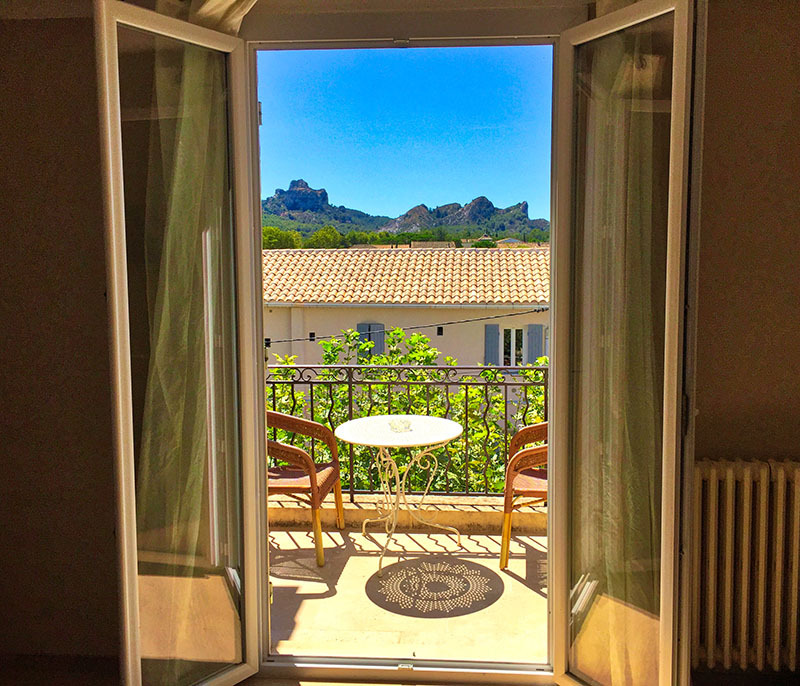 We arrived in the morning at our accommodation, Hotel Le Castelet des Alipilles, conveniently parked our car in their carpark, and explored our room and balcony with views of the pretty Provinçal buildings and mountains over which the sun set. “It was like a romantic novel of soft light, sips of wine on the terrace and girlish smiles, and we were excited to be in it!” – Kirsten’s words, not Mark’s. “It was pretty darned good” – Mark’s words. 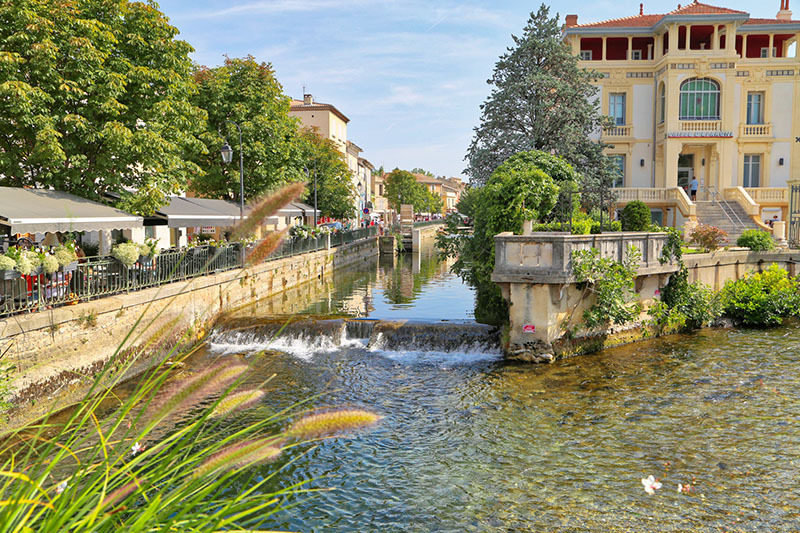 The picturesque old town of St Rémy feels relaxed and yet upmarket – with a French grace and total charm that immediately made us feel welcome. The beautiful and distinctive Plane trees that we came to love are dotted around the streets and in the evenings they caste beautiful shadows on the faded tangerine and cream buildings. Light blue-grey shutters complete many houses, offering pretty detail to the flat render and overall there is daintiness about the town that we haven’t experiences anywhere before. Many shops, restaurants and café’s are available and the pace is slow enough to linger as long as you want. We were particularly taken with Salade Chevre Chaud (hot goat’s cheese salad), the olive tapenade, and the beautiful Rosé wines. Travel tip: We should point out here that we sometimes lingered past our linger-limit while waiting for the bill to come at restaurants. We had a similar experience in Italy, although we’d caught on by then that you need to actually go to the counter and get your bill and pay. We would request the bill, then after 10 minutes request it again….then eventually give up and go to the counter. After a couple of these experiences, we realized we were doing it wrong. So just go the counter when you’re ready to leave because no-one will be pressuring you to leave and the bill could take quite some time! 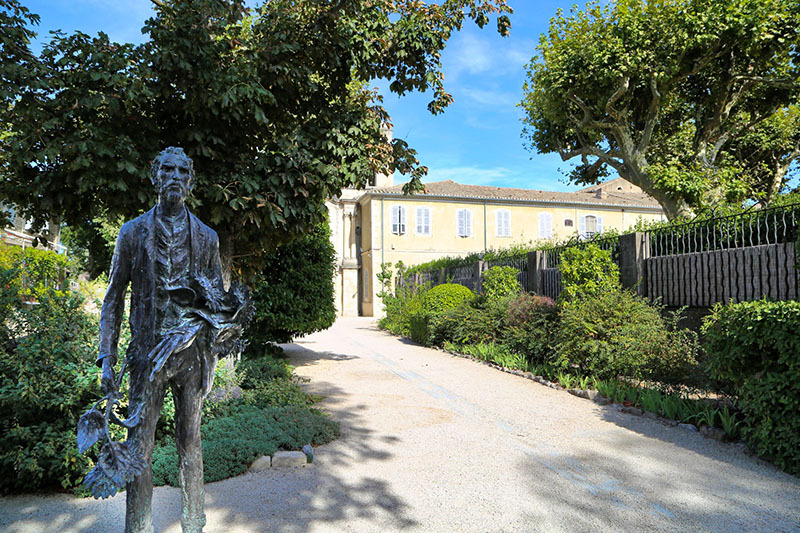 Over the next few days we explored more of St Rémy, visiting the spectacular home of many years to Vincent Van Gogh – the Asylum of Saint-Paul-de Mausole, the asylum in which he self admitted and painted some of his most famous works. We were fascinated to learn about the man Vincent Van Gogh, who lived his life in poverty, not recognised for his work, and rather detached from society. We felt for you Vincent, and we love your work. We also visited some of the area’s natural surrounds, including the Camargue Natural Regional Park, a very large UNESCO biosphere reserve that is home to thousands of flamingos, black bulls and wild white horses. We slowly drove for 2 hours around the park, stopping and getting out of the car at viewing points. We saw many flamingos, but not very close up, and we failed to find any wild white horses or black bulls. However, the park certainly is beautiful and given longer, we could have taken one of the many hiking trails through the park and I’m sure we would have seen more animals. We visited many Provinçal towns and attractions over the week – here are some photos of them below. 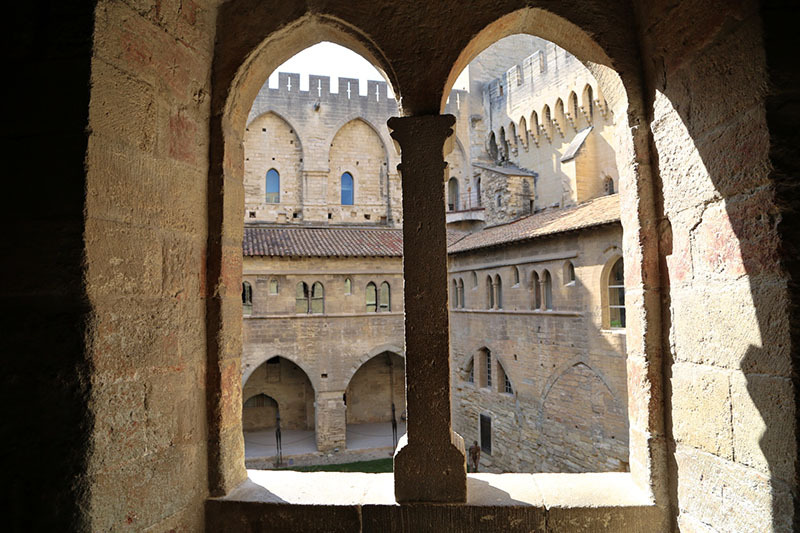 You can also see our full Provence itinerary by clicking the link. This town is as old as the hills. Just joking – they pretty much all are. 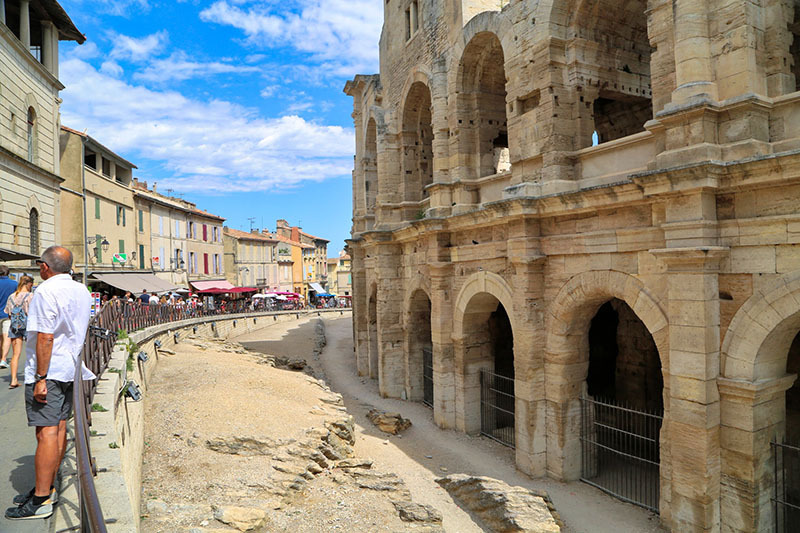 Dating back to the 7th century, Arles is a compact village of old Roman architecture and a very intact Arena – looking much like the Coliseum in Rome . We loved wandering the little laneways here. This is such a pretty township of canals and big waterwheels, ducks and reflections. Gorgeous August weather with blue skies made this town a bright and happy place to spend a day looking at antique shops and art and craft stores along with some very fancy meringues in the patisserie window….which we had to eat. Oh wow! We kind of stumbled upon this place as we were driving and we’re so glad we stopped! A little township at the foot of a mountain (Mount Vaucluse), built around a natural spring – the biggest spring in all of France. This township is blessed with natural beauty and we dreamt of driving here for cosy weekend getaways when we come to live in Provence permanently. Don’t worry family it wont happen, but it was a super nice daydream. Gawd! Are we back here again?? Somehow we managed to drive the steep winding road to the overcrowded streets of Gordes three times! Our jaws dropped the first time the ancient hilltop village came into view. It really is a sight to behold. However, we managed to keep ending back at Gordes when we were visiting nearby places and when we were trying to return to St Rémy. Given the horrendous traffic congestion, tiny roads without possibility of performing a u-turn, and people everywhere, it was a little stressful. 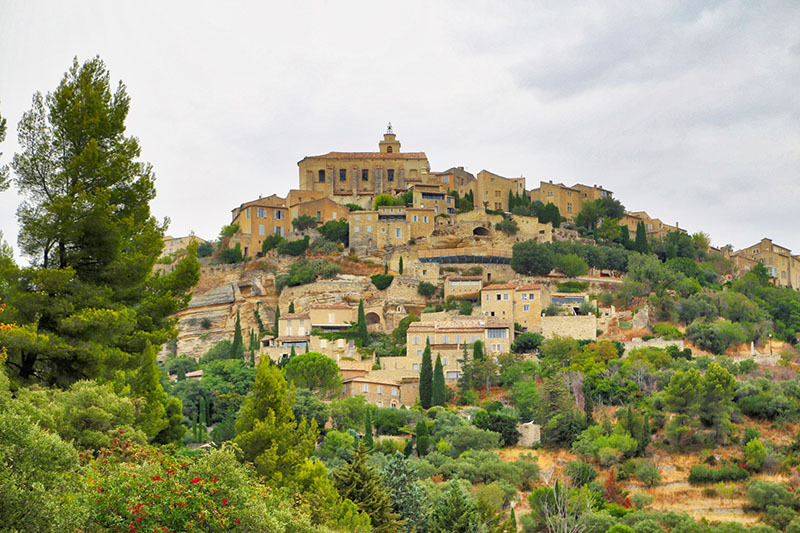 We did spend a bit of time climbing up and down stairs in Gordes once we found the carpark, and we stopped for coffee, but we were in agreement that the view from a distance was Gordes greatest asset. Not to say the village is not beautiful and it’s said to attract many celebrities to it’s fine restaurants. Avignon is a bigger city, which we enjoyed for an afternoon. Lunching in the square that is overlooked by The Pope’s Palace (Palais des Papes) and then taking a fantastic audio-guided tour through the palace (after icecream of course) was a beautiful way to spend our time there and gave us relief from the hot sun. We have seen sooo many photos of this bridge-like structure that it was one of the things we just had to see for ourselves. 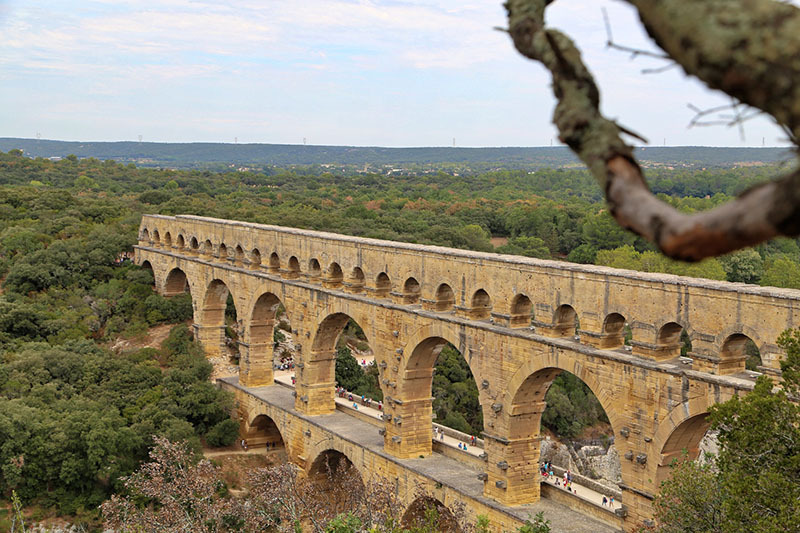 We learnt that it is an aqueduct (OK, you may have already known that), and as with many of the buidings and structures throughout Provence, it was built by the Romans. Those guys really have been everywhere and knew how to build things. They built it to channel water to their colony in Nîmes, some 50klm from the spring IN THE FIRST CENTURY! Had to highlight that because it blows our minds that something can be that old and still standing. We stayed half a day at Pont du Gard, climbing to good view points, walking across the bridge and visiting the Pont du Gard museum. Travel tip: Take your swimming costumes here and take a dip or kayak in the river. And yet another amazing medieval village set into the side of a mountain. Up in the craggy rocks, it fits perfectly in the mountain with it’s rock coloured fortifications and buildings. It’s as though the mountain itself carved out the old town and gave itself a unique face and character. We love the dramatic and magnificent vistas from here of the picturesque natural beauty of the Alpilles regional park. These days I’m pretty sure no locals live within Les-Baux-des-Provence as it seems to be more of a tourist village, perfectly preserved and offering lots of shops selling lavender and local pottery and plenty of places to rest and refresh with food and drinks. We drove up the very big hill to the very beautiful Basilique Notre Dame de la Garde which gave us great views over the city and was beautiful both inside and out. 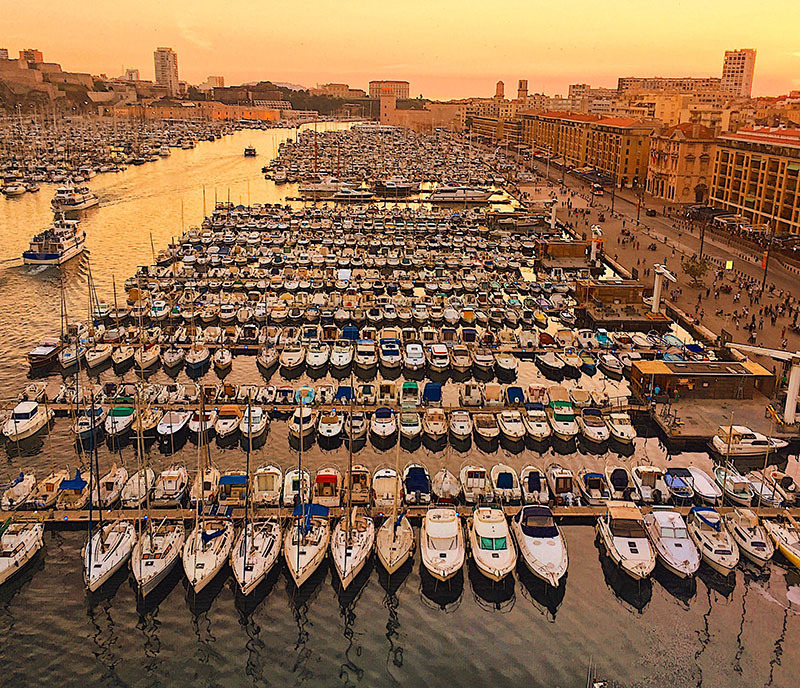 Hot tip: take a ride on the ferris wheel at sunset to see the spectacular Marseille Vieux Port in glowing orange light. Ferris Wheel with a view!